This is a great saving on V tech With and Go Dino. Buy Brok the Brachiosaurus and Get 35% Off Another Select Switch & Go Dino. We just wrote about V Tech With and Go Dinos in our review last week. They are great toys and they are going to be one of the number one toys for Christmas this year. These V Tech Switch and Go Dinos start at just $15.99. The toys can interact with each other so your child will love to have more than one. Or buy them as Christmas gifts and save! What ís so great about the VTech Dinos is all of the different play options your child can choose from. They are so versatile it encourages imaginative play. You will see why kids love them! Toys that transform from one thing to another are always popular. 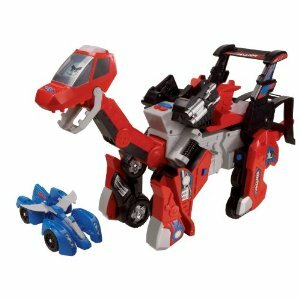 And these Switch and Go Dinos are the best transforming toys available right now! This deal to save 25% on V Tech Switch and Go Dinos ends on 11/18 so make sure you grab it while you can!